I tried using both spiralizers on this jicama and they didn’t work. I was using half a jicama though. The Joyce Chen spiralizer, I don’t think would have worked either way, but I know I’ve used the my other spiral slicer and had luck. Maybe I’ll try a whole jicama next time. 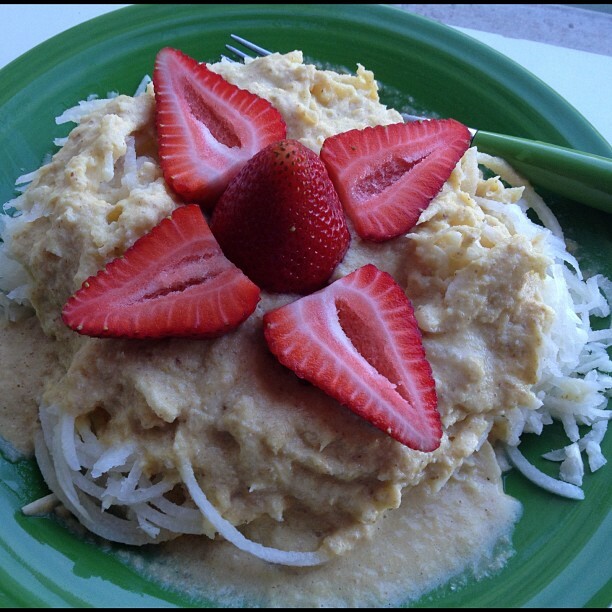 All you need to do is cut your jicama into very thin strips, shred with a food processor, or shred by hand with a grater (what I did) and you will have delicious thin jicama strands perfect for a dressing or sauce of your choice. I used 1/2 a large jicama for my serving and made a ‘blender’ dressing out of a few raw pecans, a peeled orange, and a little orange juice to get it going. These ingredients fit perfect in my tribest cup. I love using it for small quick blends like this. I topped this hydrating citrus salad with a few fresh cut strawberries and I was ready to eat! I’ve never had a mix of flavors like this for dinner and the full nutty flavor of the pecans complemented the sweet strawberries and bright citrus nicely. I will be making this again. If you have jicama on hand you can also make these raw vegan tostadas.